Sometimes New Year's Eve is a blow-out drinking event. Other times it seems to be a time to remain home-bound, savoring in the company of just a few friends, or even just one. This year was neither of those, and it was most excellent. 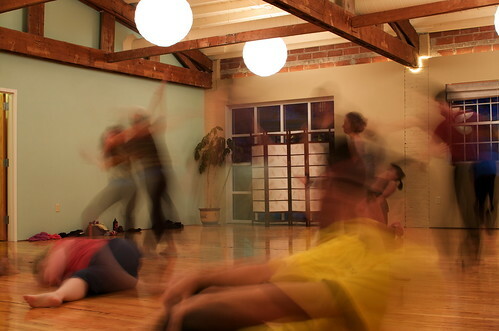 Late afternoon was filled with a 2-hour contact improv dance jam. I am sometimes at the New Year's Jam at Earthdance, and this year I was not, and was missing it. After yesterday, I am sated and no longer jonesing for that larger event. We had a rare music jam, with half a dozen talented players providing genuine improv music for our group of 24 or so dancers - a real crowd for our space. The interplay between the musicians and dancers was pretty amazing, and each fed off the other in a way that so seldom happens. It was nothing short of magical. I was not too interested in taking photos - way more interested in dancing - and so I parked the camera on a stand and left it on 10-second timer, tripping it whenever I found myself near it. I had the shutter set to longish exposures to capture the bubbly nature of the dancers. Only at the very end of the jam did I pick up the camera and shoot, and even then it was no more than half a dozen. The long exposure photos are interesting to me, and perhaps to you. Here is a link to a SLIDE SHOW where you can see all dozen-and-a-half of them.